Hello, and welcome to The ThINKin' Spot, and welcome also to our Peachy Keen Thankful Blog hop! Our designers, both past and present have come together to share some things we've created with a "Thankful' theme. You should have arrived here from the creative and very talented Cristina Garcia's Blog. If not, then you're going to want to go waaaaay back to the beginning, at The Peachy Keen Stamps Blog because this is the last stop on this hop, and you're not going to want to miss a thing! Here's a look at the card I created for this fabulous hop. You may notice that this image looks a little different than most. It's missing something, actually. Can you figure out what it's missing? How about the lines?!! That's exactly what is left out!! I used a "new to me" stamping technique, where I stamped the image in a light colored ink. In this case I used Memento ink, as I usually do, but I stamped the Tanner Turkey image in Desert Sand colored ink, instead of my standard Tuxedo Black. By using the lighter colored ink, what lines that are faintly there, completely disappear when the image is colored with Copics. Pretty cool, huh? I think so anyway! This tecnhique really reminds me more of painting, because the colors actually meet instead of having a heavy black line between them. I love the look for something a little different. Well, as I mentioned, this is the last stop on the Thankful Blog Hop! We're sure glad you could join us for all the fun, and I sure hope you've enjoyed all the wonderful and inspirational creations you've found. PLEASE tell me that you've left comments as you've hopped along, because there's $150 worth of gift certificates at stake! Yes, you heard me right! There are three $50 Peachy Keen Gift Certificates hidden along this hop. Three of our designers will be choosing one lucky winner from the comments left on their blogs. We don't know which three designers will be awarding a prize, so your best chance to win is to comment at each stop. You've got plenty of time, because we won't close our hop for comments until 11:59 on Sunday, November 11th. The winners will be announced on The Peachy Keen Stamps Blog on Monday. Don't forget about the BIG WEEK LONG SALE! 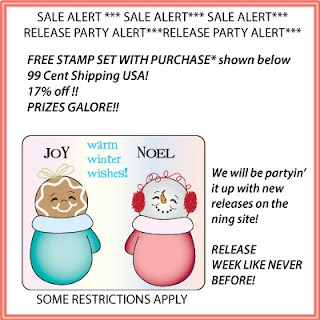 It lasts till Monday, and we're giving away a FREE STAMP SET with every $30 order! Get yours TODAY!! Below, please find a complete list of stops on the hop, just in case you want to go back for another look. 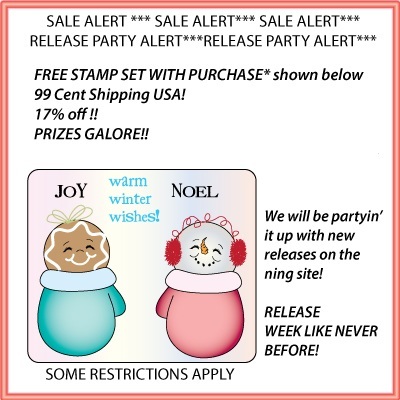 ;-) Thanks so much for hopping with us, and I hope our creations have left you ready to do some happy stamping! Love how you stamped the turkey-cool technique! Wowzer!!! This is absolutely gorgeous! I love the feathers - reminds me of the NBC peacock (telling my age on this one!). This has to be THE most perfect turkey!! Fantastic technique! little intimidating, but I may give it a try. Beautiful Miss Lorie! WOW!!! This is beautiful - and what a fabulous technique!!! I'm totally gonna have to give that a try!!! Thank you for the technique tip, and the orange trim on your card is a nice touch! This turned out AMAZING Lorie!! Beautiful! Very cool! I would have thought you used a light box. I am going to to try this when I get home. Your turkey is a beauty. Stunning creation, Lorie...love the colouring! love your coloring on the turkey. Rosemary R.
I've never seen this technique before! Love it! The colors are awesome, this turkey looks so scared. Lorie, this is the first time I've seen or heard of the "lineless" technique. Thank you for the quick tutorial on how to do it. I'm not great at coloring, but it sounds intriguing and I might try it. Your turkey looks beautiful! I hate that this blog hop is over! You ladies have outdone yourselves this go around! Thanks to all of you! WOW! your coloring is over the top incredible and I love the look of the light colored ink...without the black lines!!! I would say I would give this a try but I could never come half as close to getting is as beautiful as yours!! What a way to end this fab hop!! Fun card! Love the bling you added! Wow, your turkey is gorgeous! Beautiful card! TFS! Awesome card as always. Love the new technique you used. I am not great with the copics but I will have to give this a try. Soooooooo Cute card love it!!!!!!!!! I love the effect you got from stamping with a lighter color. Love it! That technique is wayyyy to awesome!! I LOVE it!! I am so trying it!! Your card is fabulous!! I thought as I opened your page....this is my favorite turkey. Then when I read your post I knew why. Such a great idea..stamping with a light color. I will definitely try this. cute card! love the bling!! Thanks for a chance tow in! He is awesome and I think this is an amazing technique!!! Lorie ~ OOOMMMGGG!! Well this is just AMAZING!!! You know how I feel about your coloring ~ I LOVE it!!!! But let me ay I would have NEVER and I mean NEVER have thought about using anything but black! Now I am no color expert but I must give this a try!! I LOVE tanner and have him!! I must use him soon!! Tanner is my FAVORITE turkey ever! I am sure this card is going somewhere special but just in case I am open to having him visit me!!! LOL!! What a great hop!!! ohhh wowwwww, what a cool technique Lorie, I haven't seen this before, ty for sharing how you did it, if I remember (lol) I will have to try this soon. awesome!! Great coloring technique--I will have to try this! Wow oh wow oh wow! What a beautiful technique! I am way too new with copics to give that a try, but I love the look! Just fabulous! I love this. It's just so darn cute. Thanks for sharing. You are Amazing. Love this. I need to come over your house seriously for some coloring Tutorial. Love it. Funny, I had never thought about stamping in a lighter color to hide the lines. I am going to have to give that a try! I love learning a new technique. That's why I love blog hops so much. Thanks for sharing your tip and your beautiful card. Love the "disappearing line" technique. And your bling is amazing! Great looking card. Such a cute turkey and love the bling. Lorie your no-line coloring is amazing and so are you! Thanks for a great hop! Love you! Lorie- I must say, I love your creations and I've learned a few things from your posts along the way... Today was the first time I've seen people refer to you as the coloring queen....and NOW I understand why! Brilliant! I hope when I grow up I can learn to color with my Copics like you! Amazing! Just amazing! Thanks for the inspiration! And another lesson in crafting! Have a peachy day! Oh MY! What beautiful work. Will have to come back to visit when I have more time. Your work is amazing! Really fabulous coloring and shading. Your project turned out wonderful. Thank you. Very nice card...I love all of the bling. Thanks for sharing! Oh thats the technique you had mentioned:) I have never heard of this technique before, thank you for sharing it. I am going to have to try it out:) By the way I loved your card! This is so cute Lorie! I love the colored feathers on your adorable turkey! All the bling looks so pretty too! Adorable card Lorie, that turkey is so stinkin' cute! And those colors are so vivid and pretty. I think this is the best blog hop I have seen in awhile. This is amazing - you are so talented! I'm so excited to see you try out this technique! Thank you so much for sharing! Such a great hop. Thank you. Also, the technique you used to get rid of the lines is very cool. There are so many projects and techniques if like to try. You all surely do inspire. Wow, the card is beautiful. I love the colors without the lines, it is beautiful. Oh Lorie! What a great idea and look how great Tom turned out!! WOW Lorie, beautiful card as always. Love that technique. It looks amazing. Love the colors. Awesome Coloring!Lovely Image!Super Cute Card! All you ladies rock and to answer your question yes I have got to start doing more stamping. I loved everyone's blog nice going TFS. What a great idea to make the lines disappear! Thanks for the tip! Beautiful card, awesome coloring, great LO and card stock colors, TFS! Woweeeee! Girl, you ROCKED that technique! Holy Cow (or turkey)!! ;) Stunning work, Lorie!